TUSCALOOSA, Ala. — Spring is here and summer is near, and with the increase in warm weather comes bloodsuckers. No, not vampires, but to some they cause just as much dread. It’s time for ticks, the long lost cousins of spiders and scorpions and the brothers of mites, to have their season, and Dr. John Abbott, director of museum research & collections at The University of Alabama Museums, has the low-down on what types are prevalent in Alabama, what they do, the dangers they pose, how to avoid them and what to do if bitten by one. 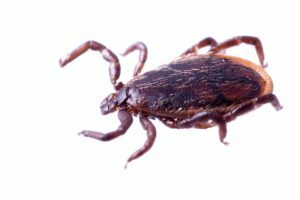 “Ticks are a particular group of arthropods called arachnids, which are related to insects but are not insects,” Abbott said. “Within arachnids, ticks are in their own group called the order of Acari, which include ticks and mites. Abbott said ticks feed by using specialized legs to quickly climb up a passing mammal. Their legs are capable of easily latching onto clothing, skin, fur and hair, making them difficult to knock off. Once they reach the exposed flesh of their desired dining location, they embed their mouthparts – some have backwards-curving spines on their mouths like barbs on a fishhook – into flesh, and females will start the blood-sucking process. Depending on the species, ticks will blood feed on a chosen host for hours to days, Abbott said. “Certain species can become very engorged with blood, up to the size of a large raisin or bigger,” he said. It is during this blood feeding that a tick in its nymph stage or an adult female – the only types that feed on blood – can transmit diseases. 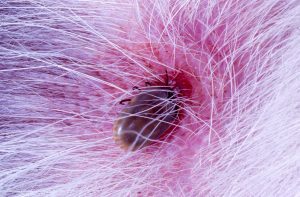 Two diseases transmitted by ticks to be concerned about in Alabama are Lyme disease and the deadly Powassan virus. Lyme disease is caused by bacterium that, once transferred to humans, causes fever, headache, fatigue and a skin rash, according to the Centers for Disease Control and Prevention. If left untreated, the infection can spread to a person’s joints, heart and nervous system. With the Powassan virus, unfortunately the time table on how quickly it is transferred to a tick’s host is not nearly as long. “Now the Powassan virus is something that the medical folks are more concerned about because you become infected within 15 minutes of a tick with it biting you,” he said. “And the virus is more severe. Some of the symptoms of Powassan virus infection are fever, headache, vomiting, weakness, confusion, seizures and memory loss, according to the CDC. “A lot of these diseases go undiagnosed, but, in the South, doctors are more familiar with these diseases so there’s a better chance of it being diagnosed,” he said. 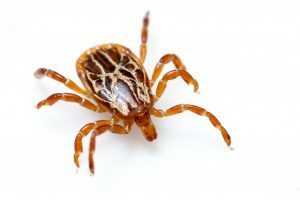 Abbott said there are four types of ticks commonly found in Alabama: the lone star tick, the deer or black legged tick, the Gulf Coast tick and the American dog tick. Dog ticks are the ones typically found on dogs and can become extremely engorged on blood – think of a grape. But it is the deer or black legged tick that is the most dangerous in Alabama because it’s the one that typically carries Lyme disease and the Powassan virus. 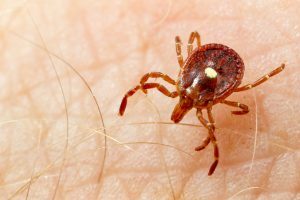 “So the deer tick will feed on white-footed mice as a nymph and, as an adult, on deer or other hosts like humans,” Abbott said. Abbott said avoiding wooded areas is the best way to avoid tick bites, but he doesn’t recommend abstaining from Alabama’s beautiful natural habitats just to avoid ticks. “The best thing to do to avoid ticks, especially if you know you’re going into a wooded area, is to wear closed shoes, long pants and spray them with DEET. You can go further and spray yourself, but really just spray your feet and legs. If a person finds an embedded tick on their bodies, Abbott said the best way to remove it is with tweezers. He said be sure to remove the tick’s whole head when removing it, or else a person may still be at risk for infection. He said other methods such as smothering a tick with Vaseline or poking it with a still hot blown out match may work, but the surest way is with tweezers.